This post has 404 views. Up until now, I usually write a full review for any anime series that I’ve followed but didn’t blog episodically, but I don’t really have the time these days because of school. It’s hard (and probably fruitless) work covering the series that I’ve already committed to. I should probably be studying instead of writing this, but alas… Anyways, from now on I’m just going to write down random thoughts for these end-of-series “reviews”. So here are my final thoughts on Umi Monogatari, a 12 episode anime based off a line of pachinko machines. Umi Monogatari is billed as a transforming magical girl series, but it has some characteristics to make itself different from the pack. For one thing, Umi Monogatari is a lot more laid back than any magical girl anime I’ve seen. It’s perhaps a little too laid-back, since the pacing never really picks up towards the end of the show. It’s probably because the emphasis on the show wasn’t really on magical girl combat; it was on the relationships between the characters and their inner struggles. This becomes more and more evident towards the end of the show as the battle becomes less about magic and more about the emotions of the two magical girls. My interpretation is that the decision is a trade-off between action and character development, and since I was expecting a leisurely series I didn’t mind the slow pacing and appreciated the focus on the characters. Speaking of character development, Umi Monogatari has an interesting set of characters and relationships. 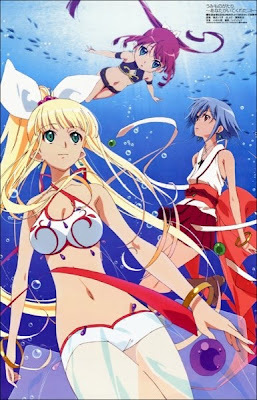 The central relationships are two connected love triangles with the protagonist Kanon in the middle. On one side, there’re the sea girls Marin and Urin and the focus is mostly on Marin and Urin’s sisterly relationship. On the other side, there Kojima and Oshima and the focus is on Kanon’s own insecurities. The setup is effective in developing the characters, particularly Kanon who eventually learns to be more positive and embrace life a little more. Marin also turned out to be more than just an always-happy hugging machine, and she and Kanon make a nice pairing that’s polar opposites on the surface but similar on the inside. As for Urin, she was just so damned cute that it didn’t matter what she did. One thing Umi Monotgatari is great at is drawing these dastardly cute little girls. Little Marina and little Kanon were very cute as well. They sure know how to draw their lolis. Other than the aforementioned note on the character designs, the production quality of Umi Monogatari is very good. The underwater scenes with the fish and corals are particularly memorable, and I liked the light palette used for many of the outdoors scenes. The action is not bad either, although mostly it was just Marin flipping and dodging. Kanon and Marin don’t really much in terms of move sets. Overall, I found Umi Monogatari to be an enjoyable watch. It’s not the most exciting series, but the show has good production quality and decent character development for a 12 episode series. Oh, and I learned that the power of yuri-hugs conquers all. I think that’s the lesson to take away from this show.